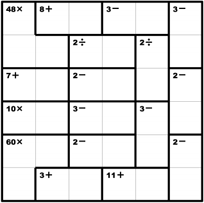 KenKen Puzzle Official Site - Free Math Puzzles That Make You Smarter! Fun, addicting, yet educational. The KenKen iOS and Android apps are perfect for the whole family! Calling all educators! 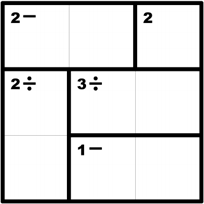 Join our FREE program to use KenKen puzzles with your students. 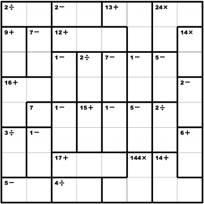 The numbers you use in a KenKen puzzle depend on the size of the grid you choose. 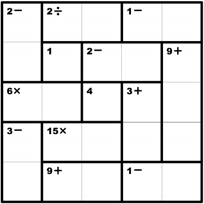 A 3 x 3 grid (3 squares across, 3 squares down) means you use the numbers 1, 2, and 3. 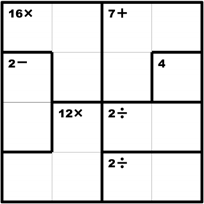 In a 4 x 4 grid, use numbers 1 to 4. 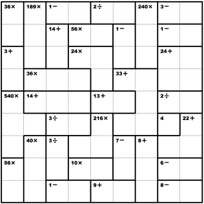 A 5x5 grid requires you use the numbers 1 to 5, and so on. 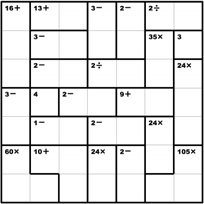 The numbers in each heavily outlined set of squares, called cages, must combine (in any order) to produce the target number in the top corner using the mathematic operation indicated (+, -, ×, ÷). Use each number only once per row, once per column. Cages with just one square should be filled in with the target number in the top corner. A number can be repeated within a cage as long as it is not in the same row or column. إملأ الأرقام من 1 حتى رقم حجم الشبكة. لا تكرّر الرقم ذاته في أي صف أو عامود. إن الأرقام الموجودة في كل مجموعة من المربعات المسطرة بشكل متقطع والتي تدعى أقفاصا، يجب أن تجمع (بأي ترتيب كان) لتعطي الرقم الهدف المذكور في الزاوية عبر استخدام العملية الحسابية المذكورة. يجب ملء الأقفاص التي تحتوي على مربع واحد فقط بالرقم الهدف الموجود في الزاوية. يمكن تكرار الرقم ذاته في قفص واحد طالما أنه ليس مذكورا في الصف أو العامود ذاته. انقر مصطلح "التحقق" في أي وقت للتأكد من صحة الحلّ. 1) Choisissez une taille de grille. 2) Remplissez la grille de chiffres de 1 à la taille de la grille. 3) Chaque chiffre ne peut être présent qu’une et une seule fois dans n’importe quelle ligne ou colonne. 4) Il est nécessaire de combiner les chiffres (dans n’importe quel ordre) dans chaque ensemble de cases, appelé « région », délimité par des lignes en gras, de façon à obtenir le chiffre cible dans l’angle supérieur de la région, en effectuant l’opération mathématique avec l’opérateur indiqué. 5) Vous devez utiliser le chiffre cible dans l’angle supérieur pour remplir les régions à une seule case. 6) Il est possible d’utiliser un chiffre plusieurs fois dans une région tant qu’il ne se trouve pas dans la même ligne ou la même colonne. 7) Appuyez sur Vérifier à n’importe quel moment pour voir si votre solution est bonne. 2) Zahlen von 1 bis n (n = Größe des Spielfelds) eintragen. 3) Jede Zahl darf pro Zeile und Spalte nur einmal vorkommen. 4) Die Zahlen in jedem fett umrandeten Kästchenblock müssen zusammen (in beliebiger Reihenfolge) durch Addieren, Subtrahieren, Multiplizieren oder Dividieren die Zahl ergeben, die oben links im Kästchenblock steht. Die Rechenart wird durch das Rechenzeichen im Kästchen angezeigt. 5) Wenn ein Kästchenblock aus nur einem Kästchen besteht, muss in das Kästchen die Zahl eingetragen werden, die oben links im Kästchen steht. 6) Eine Zahl kann in einem Kästchenblock wiederholt werden, solange sie sich nicht in der gleichen Zeile oder Spalte befindet. 7) Um zu kontrollieren, ob die Lösung richtig ist, kann jederzeit auf "Kontrollieren" geklickt werden. א. בחר את גודל הלוח. ב. מלא את המספרים מ-1 ועד לגודל הלוח. ג. אסור למספר לחזור על עצמו באותה שורה או עמודה. ד. המספרים בכל קבוצת משבצות המוקפת בקו עבה, הנקראת "כלוב", חייבים להצטרף (בסדר כלשהו) כך שיתקבל מספר המטרה המופיע בפינה העליונה תוך שימוש בפעולת החשבון הנקובה. ה. בכלובים בעלי משבצת אחת בלבד ימולא מספר המטרה המופיע בפינה העליונה. ו. ניתן לחזור על אותו מספר בתוך כלוב כל עוד הוא לא חוזר על עצמו באותה שורה או עמודה. ז. הקש על בדוק בכל עת כדי לראות האם פתרונך נכון. 1) Scegliere una grandezza di griglia. 2) Inserire i numeri da 1 alla grandezza della griglia. 3) Non inserire lo stesso numero in una fila o colonna. 4) I numeri che si trovano all’interno di una serie di caselle dal bordo più annerito, dette gabbie, devono, insieme (in qualsiasi ordine), dare il risultato indicato nell’angolo superiore utilizzando l’operazione matematica indicata. 5) Le gabbie composte da una singola casella devono essere riempite con il risultato da ottenere, indicato nell’angolo superiore. 6) È possibile inserire lo stesso numero all’interno di una gabbia purché non si trovi nella medesima fila o colonna. 7) Premere Controlla in qualsiasi momento per verificare se la soluzione prescelta è esatta. 1) 먼저 퍼즐 사이즈를 선택합니다. 2) 1부터 퍼즐 사이즈까지 숫자를 입력합니다. 3) 가로 세로 같은 줄에는 같은 숫자를 반복할 수 없습니다. 4) 한 개나 여러 개의 칸이 굵은 검은 테로 둘러싸여 있는 것을 케이지라고 부르며, 각 케이지의 상단 왼쪽 코너에 숫자와 수학 기호가 나와 있습니다. 그 수학 계산법을 사용해서 그 타깃 수치가 나오도록 해당 케이지 내에 있는 칸 속에 숫자를 입력해야 합니다. 5) 칸이 하나 뿐인 케이지에는 상단 왼쪽 코너에 나온 타깃 숫자를 그대로 입력해야 합니다. 6) 한 케이지 속에 같은 숫자를 반복할 수 있지만, 가로나 세로로 같은 줄에 있는 칸에는 같은 숫자를 반복할 수 없습니다. 1) Escolher o tamanho da grelha. 2) Inserir os números de 1 até ao tamanho da grelha. 3) Não se pode repetir nenhum número na mesma fila ou coluna. 4) Os números dentro de cada conjunto de quadrados demarcados com linhas carregadas, chamados jaulas, devem combinar (em qualquer ordem) de forma a produzir o número pretendido, indicado no canto superior, usando a operação matemática indicada. 5) As jaulas com apenas um quadrado devem ser preenchidas com o número pretendido, indicado no canto superior. 6) Pode repetir-se um número na mesma jaula, desde que não se repita na mesma fila ou coluna. 7) Sempre que deseje ver se a sua solução é a correcta, prima Verificar. 2) Upišite brojeve izmedu 1 I odabrane veličine zagonetke. 3) upisani broj ne smije biti ponovljen u istom retku ili stupcu. 4) Brojevi unutar kvadrata opisanih debljom linijon (kavezi) moraju dati rezultat naznačen u gornjem lijevom kutu korištenjem naznačene mathematičke operacije. 5) U kaveze koji se sastoje od samo jednog kvadrata potrebno je upisati broj naznačen u gornjem lijevom kutu tog kvadrata. 6) Unutar jednog kaveza brojevi se mogu ponavljati ukoliko nisu u istom retku ili stupcu. 1) Escoger un tamaño de cuadrícula. 2) Rellenar los números desde el 1 hasta el tamaño de la cuadrícula. 3) No repetir ningún número en ninguna fila ni columna. 4) Los números en cada grupo de casillas con borde grueso, llamadas jaulas, tienen que combinarse (en cualquier orden) para producir el número proyectado en la esquina superior usando la operación matemática indicada. 5) Las jaulas con solo una casilla deben ser rellenadas con el número proyectado en la esquina superior. 6) Un número puede ser repetido dentro de una jaula en tanto que no esté en la misma fila o columna. 7) Pulsas Comprobar en cualquier momento para ver si tu solución es correcta. To start, click on any square. A "number ring" appears with that grid's possible numbers. These numbers will also show up on the left side above the grid as the "Notes" box. Ready to fill a number in that square? Just click the one you want in the number ring. It will then appear in the middle of the square. Narrowed it down to a couple of numbers but still not totally sure? Click the numbers you want from the Notes box. They'll show up smaller in the square. Clicking will place all possible Notes in the square. Clicking will get rid of all the Notes in the square. If you'd like to repeat a note (notes) in another square, simply drag the number from the original square to the new one. Click here to see the video of how it works. When you've ruled out one of your notes, click on it again in the Notes box. The number will disappear from the square. When you fill in a number in a square (by selecting from the number ring), any notes in that square will disappear. Changed your mind about a number? In the number ring, click the red eraser icon to clear the square. To hide the number ring, click the red "X." How to Use the Keyboard: You can enter numbers and notes by using the keyboard. Once you’ve selected a square, you can press shift and a number key to enter (or delete) that number as a note. Or, to just enter a number in a square, press that number on the keyboard (no shift). To delete a number or note, press C.